I am pleased to announce that I will be conducting Social Skills Summer Camps at Charlotte Christian School this Summer. 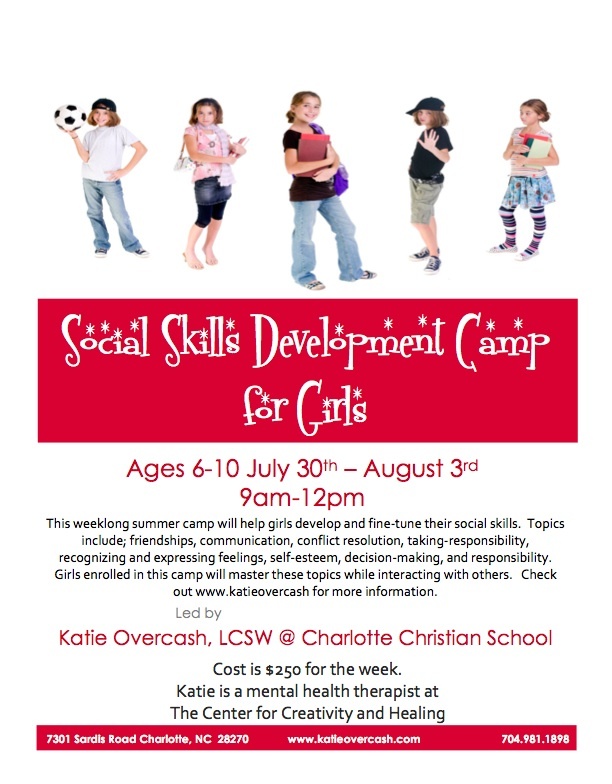 This weeklong summer camp will help girls develop social skills. Children enrolled in this camp will master these topics while interacting with their peers. Each group will begin at 9am and end at 12pm. All camps are located on the campus of Charlotte Christian School, 7301 Sardis Road, Charlotte, NC 28270. Cost is $250 for the week. Please visit Charlotte Christian’s website for registration and payment by clicking here. Registration is still open, however, space is limited. After registration is complete, please download the appropriate paperwork on the list and email it to katie@katieovercash.com. Please note that your child cannot begin camp until all of the paperwork is turned in. Please remit payment to Charlotte Christian School only. If you have any questions, feel free to call Katie @ 704-981-1898. I look forward to working with your child. This entry was posted in Uncategorized and tagged Camps, Charlotte, Charlotte Christian School, Charlotte North Carolina, communication, girls, making friends, recognizing feelings, self-esteem, Social skills, Summer camp on July 24, 2012 by katieovercash.